ACI Motors Managing Director Dr FH Ansarey and Executive Director Subrata Ranjan Das are seen at the opening day of the 5th Dhaka Bike Show at International Convention City Bashundhara (ICCB) in the city on Thursday. 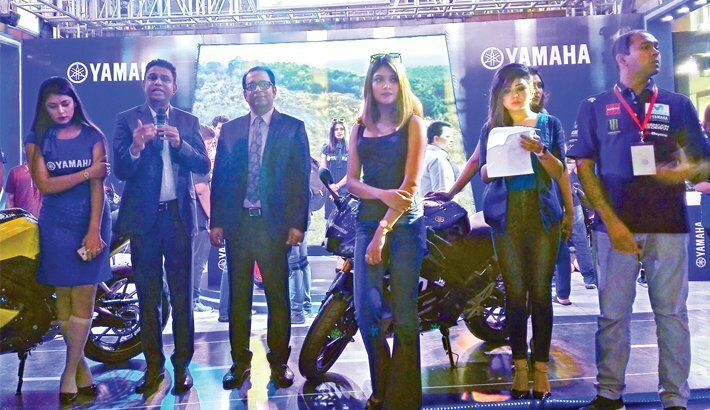 Yamaha took part in the 5th Dhaka Bike Show with many attractive arrangements from 14 to 16 March 2019 at International Convention City Bashundhara (ICCB) in the city. Yamaha has planned the arrangement into 2 parts display and activity. Bike lovers could enjoy for the first time to touch and feel experience with YAMAHA’s new model bikes, said a press release. Bike lovers will also be delightful by the display of Yamaha Sports, Touring, Off Road, Style & Power and Scooter segment bikes in the Show. Besides, special skilled riding will be conducted under the trainer, trained from Japan by the initiation of Yamaha Riding Academy. Safety and other necessary cautions would be highlighted during this training session.